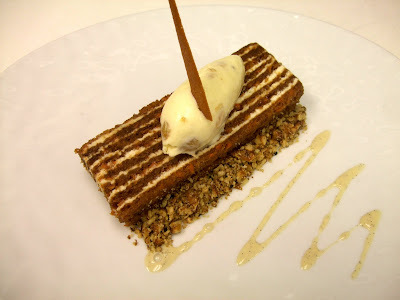 The Source's 15-layer carrot cake. The first time I made a layer cake, its four tiers looked like I'd cut them with a chainsaw. With a blindfold on. So I know it takes practice to get the layers all even and lovely looking. And that's what I find so impressive about the 15-layer carrot cake served at The Source. So you don't have to attempt a cake with 15 layers, the restaurant is offering chef Scott Drewno’s spiced carrot cake with cream cheese filling for purchase through the holidays. That artful squiggle of sauce on the plate, however, is entirely up to you. The cake is available in small (4-8 people, $30), medium (10-12 people, $60) or large (12-20 people, $90) sizes. Order it with 48 hours advance notice by emailing sourcecakes@wolfgangpuck.com or calling 202.637.6100.